Sean & Candice | Paperversary Reveal — Paper Rose Co. 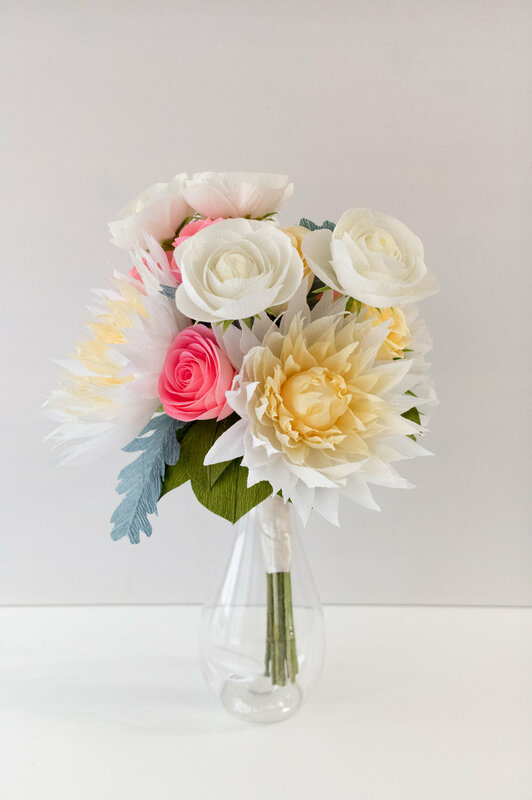 Projects like Sean and Candice's Paperversary bouquet are one of the many reasons why I'm so glad I started making paper flowers. Sean initially contacted me while deployed, in search of flowers to send his wife for their first anniversary. After chatting back and forth, we worked out a plan for me to ship her an arrangement to enjoy while he was away, and at the same time, I got to work creating this replica for him to give to her at Christmas. I particularly loved working on this piece because right away I could tell how excited Sean was about it, and how much he wanted to surprise his wife. This is usually the case with the husbands I work with, but given the fact that he was in the middle of a deployment and taking the little time he had to work through all details with me was extra impactful. 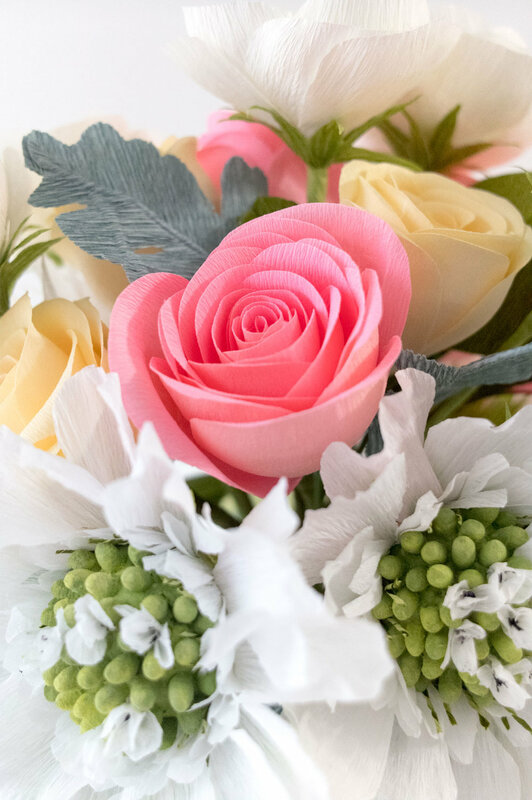 I'm continually humbled by military families and the sacrifices they endure—I knew had to make sure this bouquet was awesome for them! The arrangement contained a new-to-me bloom–the scabiosa. It wasn't until recently that I'd even become acquainted with these guys, but I'm glad I know them now. It took a little trial and error, but after an aha moment, I think I came up with a pretty brilliant solution to their unique centers. 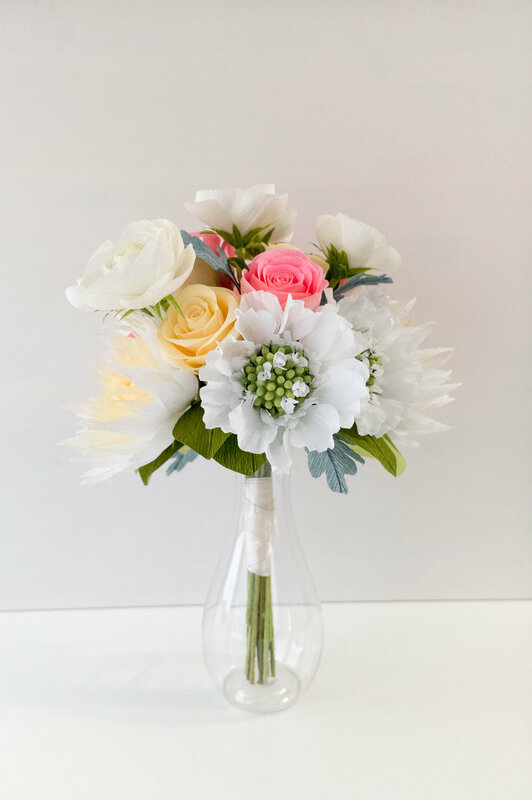 The scabiosa I've seen in person is so much smaller than what was used in this bouquet—I may have overcompensated a bit, but they're such a fun statement piece for the arrangement I think it works. Paired with oversized dahlias, roses, ranunculus, and multitoned greenery, I think the California vibe came through loud and clear in the end. After Christmas, I got this note from Sean, which just completely made my day. It turned out to be the best gift of the day... of course! It was fun to see her reaction though. I could see her slowly piece it all together as she slowly began to recognize each of the flowers while she unwrapped it. Everyone else that's seen it is completely blown away too by the details and craftsmanship of each flower leaf and stem, but then they're left speechless after I show them the picture of the wedding bouquet it's based off of. Thank you again for all your help in making this the perfect first year anniversary present, definitely won husband of the year with that! And that's why I do this. I want everyone to win husband—or father or wife or sister or friend, whatever the case may be—of the year. Nothing could make me happier. Here are a few more photos of the pieces I made—I'd love to hear what you think! And if you have an idea for a Custom Design or a Paperversary bouquet, be sure to send me a note.